When we think about retirement, most of us envision hours of leisure, maybe travel, and perhaps a scaled-down living situation like a condo or an "active adult community." Most of us don't expect that we'll be doing backbreaking work in an Amazon warehouse while living in a van. But that's what many retirement-age people in the US are doing, and Jessica Bruder reports on this little-known subculture in her new book. The author meets lots of people but mostly follows one - Linda May is in her sixties and moved into a small camper she called the Squeeze Inn once she could no longer afford to stay in the mobile home where she had been living. Her dream was to buy a piece of land and build an Earthship, an off-the-grid house made of natural and recycled materials. In the meantime, she needed to earn some money while living very cheaply. So she traveled from place to place following seasonal work at Amazon and at campgrounds while living in her tiny mobile space. Although Linda and the other "workampers" are mostly forced into the lifestyle by their financial situations, many of them embrace this new way of living. It's an escape from what they see as a consumerist rat race. Although Linda May ultimately does buy her land so she can build a permanent dwelling, it's because she knows the lifestyle will be harder as she ages. In the meantime, she has made very close friends of others like her. Although they travel, they see each other at jobs and at annual get-togethers. In the winter, many gather in Quartzsite Arizona, and attend an organized get-together called the Rubber Tramp Rendezvous. Their subculture even has favorite books, such as Steinbeck's Travels with Charley, Walden by Thoreau, and Wild by Cheryl Strayed. Most of us wouldn't happen to come across these van dwellers in our daily lives, or recognize them if we did. 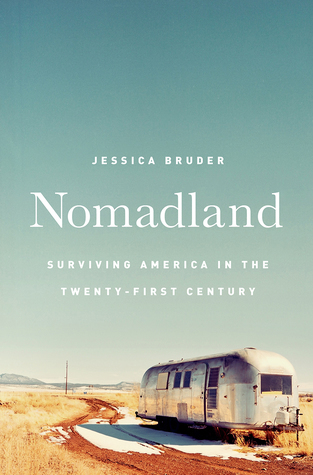 After spending time in this community and even living in a van herself, the author recognizes some lived-in vehicles back home in Brooklyn, now that she knows what to look for. Of course this makes me wonder if I've ever come across any "workampers" myself. I love learning about hidden cultures or communities I didn't know anything about, especially ones that exist right here in the U.S. It's just neat to know how very many different kinds of people there are who have such different experiences from each other. Of course, some elements were pretty depressing. I mean, none of this would even exist if there wasn't such a huge and unjust income disparity in this country. And the fact that people who have worked hard for decades are being forced into such hardship is appalling. Amazon complete exploits these workers, which is confirmed again and again in this book and I can't believe they're getting away with it (except of course I can because that's totally America.) And it's noticeable that the members of this community are almost entirely white, which the author attributes to the dangers of traveling while black. Throughout my reading, I was so aware of the fact that many of these people had stable professional careers until one thing went wrong, and I kept wondering "Could I live in an RV if I had to?" because it seems like it could happen to any of us. Bruder seemed to focus on the positive, but perhaps the people she encountered really did remain positive about their situations. I really admired the resilience of everyone I met in this book, and I can see a sort of freedom in their lives on the road with few possessions and a new appreciation for non-material things like friendship and community. My only criticism was that it didn't really address what happens when they simply become too old for the lifestyle, or became too ill, and I wondered about that a lot. Otherwise, I really enjoyed this glimpse into a world I didn't even know existed.